A train has derailed south of Egypt's capital Cairo, injuring at least 15 passengers, officials have said. There are differing reports on what caused the crash, and on the number of people hurt. One passenger told BBC Arabic in Cairo that some people had been killed, although a health ministry spokesman said no-one had died. The train was heading into Cairo from the province of Suhag when it came off the line in the Badrashin area of Giza. "Three wagons of train number 990 came off the tracks without any loss of life," Kamal el-Daly, head of Giza police investigations department, told Reuters news agency. "The injured received treatment in hospital and were able to leave." According to other accounts, only two carriages derailed. 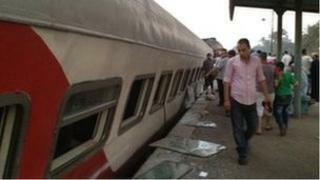 Egyptian Railway Authority chief Hani Hegab earlier explained that the train had hit planks of wood and metal that had been put on the tracks by passengers of another train to allow them to cross the lines. Earlier reports claimed that the train had crashed into a lorry, and one report on the AFP news agency said it had hit another train. Egypt's last major rail crash was in 2009, when some 18 people were killed and dozens injured in a collision between two passenger trains in the Giza area. In 2002, a train caught fire in Cairo killing 373 people.